During the apartheid era, sport in South Africa played a central role both for those who wished to punish the regime through sanctions and others who wished to break those sanctions by setting up so-called ‘rebel tours’. Rugby and cricket were in the forefront of dies battles but the largely black sport of football was ignored. Because soccer requires little investment to play, it is the most egalitarian of sports and the black underclass took to it with great gusto. Post apartheid, soccer became the unofficial national sport and attendances grew. In April 2001, Ellis Park Stadium in Johannesburg was to host the biggest club match in South Africa – the Soweto Derhy between the Kaizer Chiefs and the Orlando Pirates, As kick-off approached, a capacity crowd of 60,000 was already in the ground but outside as many again were keen to gain entry, While many stadiums across the country had fallen into disrepair, Ellis Park was one of the country’s finest. However, poorly trained stewards could not cope with the sheer weight of numbers pressing to get in. The guards panicked and fired tear gas into the air. This led to a stampede, with people running everywhere, many of them into the already full-to-bursting stands. The pressure was at its most intense in the East Stand and, as the massed ranks of fans pushed against the perimeter fence, it gave way under the strain. While some at the front escaped, many were unwittingly trampled by those coming up behind. The injured were laid out on the pitch alongside the dead and dying. Calls for medical assistance went largely unheeded as emergency planning was virtually non-existent. The walking wounded had to fend for themselves; the more seriously injured stood little chance of survival. The lack of crowd control had ended in tragedy. What was the Ellis Park Stadium Stampede Death toll: 43 dead, over 250 injured. 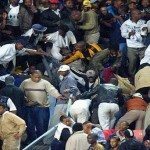 You should know: The incident is the worst disaster at a sporting event in South Africa, but only just. A decade earlier 42 people were killed in a stampede when the two teams met in a pre-season friendly.